Spearmint Oil Benefits – Spearmint, also called Mentha spicata, is a perennial plant originating from Europe. Its name is taken from the shape of its spear-like leaves. Spearmint plants are usually made as toothpaste, mouthwash, candy, and gum. Spearmint has a pleasant sweet taste and has a variety of benefits. One way to enjoy spearmint is to brew it in hot water as a tea. You can make it from fresh leaves or from dried leaves. Among the benefits of spearmint essential oil is removing gas, helping to eliminate bloating, good for digestion, treating nausea and motion sickness, stimulating oral health, accelerating wound healing, increasing appetite, treating fever, preventing cancer, inflammation and good respiratory health. Let’s get to know more about the spearmint plant. Spearmint essential oil is a popular essential oil from the spearmint plant, a plant that is still in the mint family and has the same benefits. Spearmint was originally a plant that originated in Europe and then spread throughout the world. Below we see the benefits of spearmint oil that good for our health. Carminative is a good substance to eliminate bloating as in turmeric essential oil. Spearmint oil makes small gas bubbles that stick together into one bubble so that it is easily removed from the stomach. This carminative nature damages the bubble wall so that it blends into a large bubble. The carminative properties possessed by spearmint essential oil are useful for removing gas in the stomach and providing abdominal comfort. Spearmint is good for balancing stomach acid and promoting the breakdown of food in the stomach. In addition, spearmint essential oil is also useful for reducing stomach cramps associated with diarrhea and menstruation. 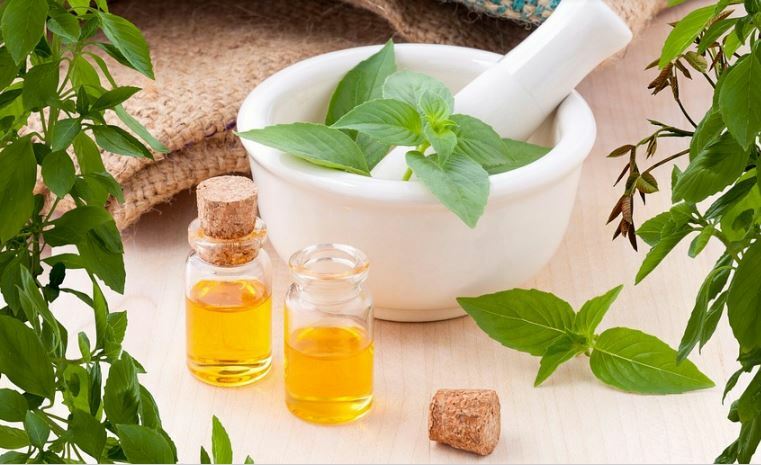 It is said, spearmint essential oil is useful for overcoming nausea and vomiting because it can reduce CTZ (chemoreceptor trigger zone), an area adjacent to the brain in charge of our vomiting reflux. In addition, it also has the ability to reduce stomach acid so that it adds a positive effect to reduce vomiting. Spearmint oil benefits also have related to antioxidants. Antioxidants are substances found in plants that are useful for fighting free radicals in the body. Free radicals enter together with the food we eat and also come from the environment. Spearmint oil is able to minimize the adverse effects of free radicals so it is good for preventing cell damage. Free radicals are strongly associated with several chronic diseases such as heart disease, diabetes, and cancer. So, the benefits of spearmint essential oil are preventing cancer, diabetes and other dangerous diseases. Spearmint contains many antioxidants such as rosmarinic acid, flavanones, and flavones. They all act as a recovery of the body against exposure to free radicals. The results showed that spearmint contains antioxidants that are very active against free radicals. In research, extracts from spearmint plants can prevent fat oxidation in meat and are as effective as BHT synthetic antioxidants. Furthermore, the benefits of spearmint oil are as a mouthwash. In many types of mouthwash, spearmint is widely used to provide freshness and make fresh breath throughout the day. In addition, using a mouthwash made from spearmint can also function as an antimicrobial. The unclean mouth can be the cause of the entry of germs and bacteria into the body. One disease caused by unclean mouth is heart disease, the heart disease bacteria usually come from the mouth that is not clean. One of the benefits of spearmint essential oil is to stimulate blood circulation. You can breathe or consume spearmint oil, this will provide stimulation to the heart to increase blood flow. This is good if you have a blood flow disorder such as varicose veins. As a result, oxygen will be sent smoothly throughout the body so that the organs of the body will be optimally active, especially the brain. Spearmint oil is a powerful antiseptic agent and is very useful for preventing infection. If you use spearmint regularly on external wounds, it will speed healing and prevent future adverse effects. If you experience a hormonal imbalance (in women) then take spearmint tea, this will help with your problem. A study in women, spearmint oil can reduce testosterone in men and increase the female hormone needed for ovulation, these hormones include luteinizing hormone (LH), follicle-stimulating hormone (FSH) and including the hormone estradiol. In another study of 21 women who experienced hormonal imbalances given two cups of spearmint tea every day. The results are very good for reducing testosterone and increasing LH, FSH and estradiol levels. Besides that, a study in experimental mice, spearmint essential oil was able to reduce the level of testosterone and ovarian cysts and increase the number of viable eggs in the ovaries of mice. Then, the health benefits of spearmint oil are to help reduce facial, chest and stomach hair for women. Actually, spearmint oil is an herb that is often used by middle-eastern people to reduce hair growth. Levels of male hormones or endogenous hormones cause more dense hair growth. Spearmint oil helps reduce the level of these hormones so that it can reduce hair growth. This is supported by research evidence. A study of two women who had facial hair and they consumed spearmint tea regularly. As a result, hair growth on their faces decreases. Another study conducted on 41 women with PCOS, they were given 2 cups of spearmint tea every day and the results showed that their facial hair growth was reduced. The study was conducted for 30 days, perhaps to be able to determine more accurate results, they must consume spearmint tea even longer. Spearmint oil or spearmint tea are also useful for improving memory. In experimental mice given spearmint extract proved to be able to improve their memory in their appearance in the test. Previously, there were studies on humans, where those who chewed mint had an increase in memory. However, after the second trial, they failed to find this benefit in the participants. For people with diabetes, consuming spearmint tea is good for reducing sugar levels. This research must be done more in humans. However, research conducted on mice has shown great benefits for blood sugar. There is a study, in which mice were given 9 mg of spearmint extract per pound or about 20 mg for 20 body weight. The results of this study indicate that healthy mice did not experience changes. However, for the group of mice that had diabetes, their blood sugar levels dropped significantly. One other benefit of spearmint tea is a stress relief and increased relaxation. In South American countries, spearmint tea is used to eliminate and reduce stress levels. A study in mice has decreased anxiety and can improve sleep quality. True, spearmint leaves contain menthol which is useful for calming.